The kind people at Namaste Foods recently asked if I would review a couple of their products on this blog and they generously sent me a reusable tote bag, some coupons, recipe cards and a package each of their Blondie Mix and Say Cheez Pasta. After a disappointing round with the Blondies (the crust was hard on top, but the bottom was underdone, even after the requisite baking time and the clean toothpick test), I made the Say Cheez Pasta a couple of days later and was similarly disappointed. The noodles had a nice, springy texture (they contain hemp seeds), but the sauce was not to my taste. 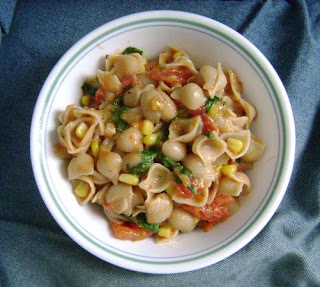 Say Cheez is a vegan, dairy-free and gluten-free pasta dinner, and the ersatz "cheez" was just not delicious. I relayed my comments back to Namaste and the spokesperson offered to send me some other products to sample. 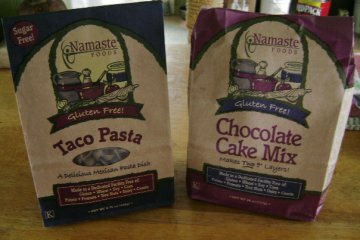 I demurred, but even so, another Namaste package arrived at my door a few days later containing a bag of Chocolate Cake Mix and Taco Pasta Mix. I sampled a bit of the pasta seasoning mix and found it palatable, so I made up a batch, throwing in some frozen corn kernels in with the boiling pasta, and then adding in a 14 oz. can of diced tomatoes (drained), some chopped cilantro and shredded Cheddar. So far, so good. The Taco Pasta was gobbled up for dinner by everyone at the Crispy Kitchen. Then it was on to baking up the Namaste Chocolate Cake Mix. I was a little leery after the Blondie debacle, but this was fantastic cake. Unlike some other gluten free mixes that only make one layer, this cake mix makes two regular cake layers and it was truly delectable and moist. The cake was not too sweet, either, which is how I like my sweets. My husband is not particularly a chocolate lover, but he was having this cake for the next several days as breakfast and snack, so it was truly a hit. I frosted it with homemade vanilla buttercream frosting, snazzed it up with some red sugar sprinkles and this was a festive and delicious Valentine's Day dessert for us. Thanks to Namaste Foods for sending me not one but two boxes of samples to try. While the first two were not something I would buy, the second two items were tasty and the chocolate cake, in particular, is one that I will seek out again and again. I am not only impressed by the flavor and moistness of the cake, but the Namaste products are a bargain as well. The 26 oz. Namaste Chocolate Cake Mix makes two standard cake layers, while the 15 oz. 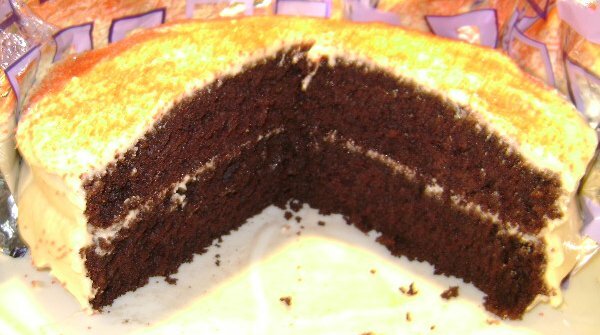 Betty Crocker Devil's Food Cake Mix only produces one layer. One can buy 6 bags of Namaste Chocolate Cake mix now on Amazon for $29.99 (includes free shipping) and make 6 two-layer cakes, compared to the Betty Crocker Mix, which Amazon is now selling for $21.46 (plus shipping), and which only makes 3 two-layer cakes. Locally you can find Namaste products at Four Seasons on Phila Street in Saratoga Springs and at Pure and Simple on Washington Street in Glens Falls. I'm impressed that this small company was confident enough in its products to try and win me over with something different even after I gave them my feedback about the first box of Namaste goods. I'm also delighted that they make their products in a dedicated gluten-free, soy-free, corn-free, dairy-free, and nut-free facility, so I don't have to worry about cross-contamination issues and so that I can serve Namaste baked goods to some family and friends that have other food allergies. But most of all, I'm delighted that I can make a darn good chocolate cake, all two layers worth, for my family as an occasional treat. Thank you Namaste! I absolutely love love LOVE Namaste's chocolate cake mix! I've made it numerous times (even made it into a black forest cake once). I like to make a cake, and use the rest of the batter for cupcakes. Thanks for sharing the price comparison for amazon. I need to stock up on this great product! I really like Namaste's Say Cheez. Too bad it wasn't to your taste. Namaste can send me samples anyday!